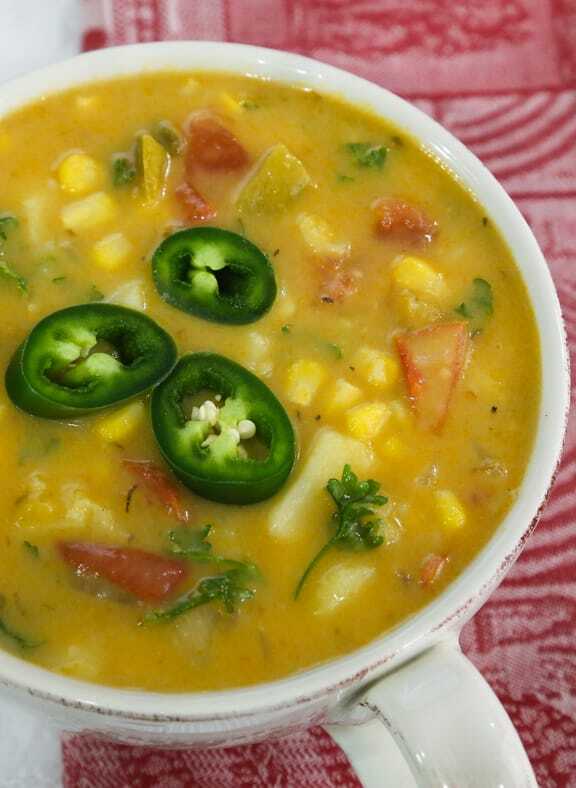 harvestThis flavorful soup of potatoes, corn, and green chiles is a nondairy version of a contemporary classic from the American Southwest. It’s filling, so it can serve as a centerpiece of a meal, served with a salad or salad-y wraps. Try this with Cool Refried Bean Wraps for a nice meal. Photos by Evan Atlas. 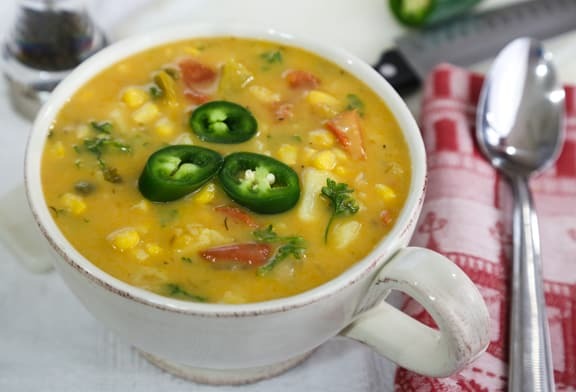 This flavorful soup of potatoes, corn, and green chiles is a nondairy version of a contemporary classic from the American Southwest. ¼ cup finely chopped fresh cilantro or parsley, or more, as desired. Heat the oil in a soup pot. Add the onion and sauté over medium heat until translucent. Add the garlic and green pepper and sauté until the mixture begins to turn golden. Add the potato dice and broth or water with bouillon cubes. Bring to a slow boil, then lower the heat and simmer gently, covered, until the potatoes are tender, about 15 to 20 minutes. Reach into the pot and mash about half the potatoes roughly, or just enough to thicken the base. Add the tomatoes, corn, green chilies, cumin, and oregano. Add additional water as needed to give the soup a thick but not overly dense consistency. Stir together, return to a simmer, then simmer gently for 10 to 15 minutes, or until the tomatoes and corn are done. Season with salt and pepper and simmer over very low heat, stirring frequently, for another 5 minutes. Just before serving, taste to adjust seasonings and stir in the cilantro or parsley. Sorry for the confusion, Samantha. Last time I made this I decided it totally didn’t need the vegan cheese, and forgot to take it out of the description. It’s been amended. However, feel free to stir in half a cup or so of cheddar-style vegan cheese into the soup once it’s finished cooking and stir until melted. Awesome soup! Hearty & filling. Try adding some shredded chicken and it makes a great lunch. 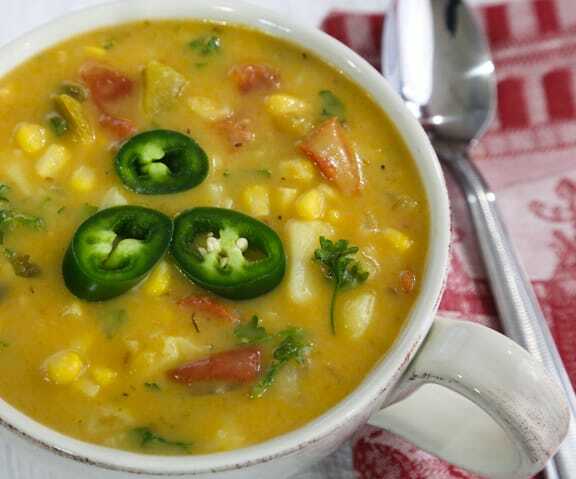 What an amazing soup! Just what I was craving on a cold, rainy day. Made it exactly how it’s written and it’s just wonderful. Thank you so much. Looks interesting…but where are the green chilies. I LOVE green chilies. I might have to try it with green chilies instead of the bell pepper. Janet, the chiles are right there in the ingredient list, after the corn kernels. Enjoy! I added green chille instead and it was delicious! Instead of jalapeño or poblano. Great recipe, and I am not even vegan! Thanks, Verena! Glad you enjoyed it.